The grief at the loss of a dog is experienced by all owners, and for the elderly particularly it can be a devastating blow. In some circumstances, elderly and single people may develop an obsessive relationship with their dog which to them seems their only genuine friend; in certain cases large amounts of money are left in the owners' wills for the dogs' upkeep. Such behavior ma y seem bizarre to non-owners, but understandable to other lonely dog lovers. When a loved dog dies, grief can be intense, and cases of pathological extended mourning have been reported by psychiatrists. 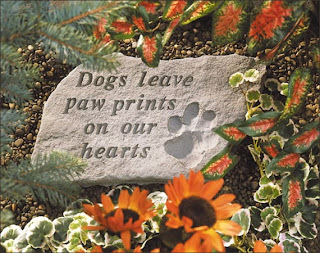 Some owners may grieve over their dog for a year or longer, a time span comparable to that following the death of a close relative. However, there are several differences between the two mourning processes. Various ceremonies and routines attend a human death and these ma y in themselves help the bereaved to cope with the grief, aided by emotional support from friends. No graveside rituals pertain to the death of a dog, but often the most upsetting aspect is the lack of understanding by other people. Dog owners are often so embarrassed at their own strong feelings over the loss of their pet that they have difficulty in talking about it.